Team members are, from left to right, front row, Taylor Noszka, Emma Simpson, Sophie Huffman and Ava Hester; back row, assistant coach Brian Long, Caroline Diels, Kayla O’Dell, Sydney McCord, Katie Murphy, KeAsia Robinson, Dani Brannon, Lexus Reiley, Aeris McDaniel, head coach Jermaine Isaac. 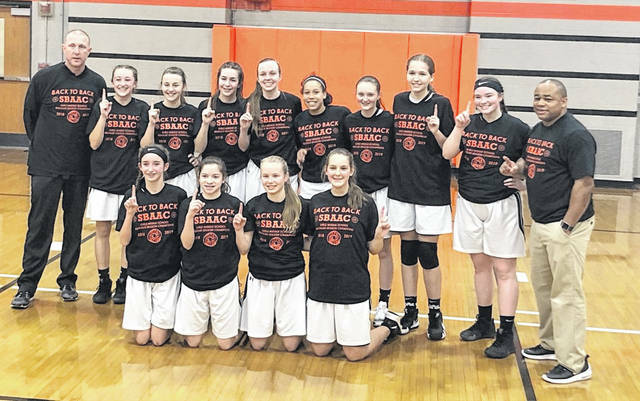 The Rodger O. Borror Middle School eighth grade girls basketball team won its second straight SBAAC championship this season, finishing with an overall record of 14-1. The young Lady Hurricane is the No. 1 seed in the SBAAC Northern Division tournament, which begins Saturday. The Borror girls will play 5 p.m. Monday against either Mt. Orab or Clermont Northeastern.